Behind the slanted beams of a 1,000-foot wave wall, Steve Plotkin and his family own a watery oasis that gives boat owners and their lucky guests a way to literally transport themselves from life’s everyday worries. Take away the majestic view of the Palisades across the Hudson River, and one could just as well be on Cape Cod, Mass., the Jersey Shore or in Newport, R.I., instead of the Half Moon Bay Marina in Croton-on-Hudson. 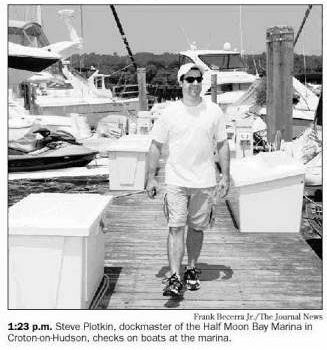 Plotkin, a 31-year-old Croton resident, has been Half Moon’s dockmaster and manager for about 12 years. Originally connected with the wood-shingled Half Moon Bay condominiums that overlook the marina, the now-independent business is riding high on the latest trend in marina management — the sale of “dockominiums,” boat slips that one can buy and own rather than rent. Since introducing dockominiums to the 173-slip marina in 2002, the real estate has “appreciated through the roof,” Plotkin says while standing on what the marina bills as its unsinkable dock system. Plotkin is a constant presence on the docks. On a day when even the merest outdoor activity brings out a sweat, Plotkin forsakes his marina office to greet boaters as they return to their slips or check on the needs of those working on their boats. By 4 p.m., he’s given up the T-shirt he wore earlier in the day. Martinez, who’s also doffed his shirt, is at the marina today cleaning and checking the engine on his 27-foot Carver, which he’s preparing to sell after five years of ownership. “My knees aren’t what they used to be,” he says, explaining that it’s become too difficult to maneuver his way through the docking process. The boat is named Ms. Print in honor of his daughter, a New York Post reporter. Martinez says he once owned a slip at Half Moon Bay, and had just paid it off, when his daughter announced she was engaged. The slip’s since been sold to pay for the wedding this fall. A couple of slips down the dock aboard the Scooch, Peter Pascocci, 61, is also working on maintenance, waxing and filling up the fresh-water system. The Ossining resident’s Hunter 295 sailboat is equipped with a television and two showers. Among Half Moon Bay’s benefits are that it’s a deep-water marina — a rarity on the Hudson, where low tide prevents larger boats from docking close to shore — and that it can accommodate boats up to 100 feet long. That ability is one reason why Charlie Mellchner, the owner of Mahopac Marina on Lake Mahopac, docks his 50-foot-long Sea Ray, the Diamond Lil, at Half Moon Bay. He’s returning to the marina at 4:10 p.m. after fueling up in Haverstraw. Mellchner bought the boat, named for his wife, Lillian, two months ago for a change from a more “aggressive” boat he says used to nearly send the grandkids bouncing off the back. “We can entertain on this boat. We can live on this boat, if we want to, and Lillian can be comfortable and that means a lot,” he says. Reach Laurel Babcock at lbabcock@thejournalnews.com or 914-694-3501.